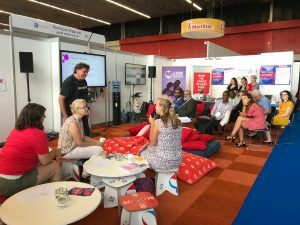 During the AIDS 2018 conference in the RAI in Amsterdam, the Community of Practice on Sexual and Gender Diversity (SGD) of Share-Net Netherlands facilitated a session for visitors of the global village. When people should focus on love instead of on sexual acts, celebrating sexual and gender diversity would more easily be appreciated worldwide. The integration of an SGD perspective in the preparation, design, implementation, monitoring and evaluation of internal and external policies, regulatory measures, advocacy, and programmes. People of different countries participated; from Nigeria, India, Malawi, Spain, Iran and the Netherlands. Questions were raised about how the mainstreaming exactly was done to convince NGO’s in Kenya to include SGD; what worked well? Albert explained that personal testimonies from LGBTI people were very powerful in addition to public health and human rights arguments. Interesting proved also to be that key concept could be used to frame the discussions on SGD as it allows to speak about the sensitive topic of SGD in communities within a frame like injustice, zero tolerance or dignity. A father of the National Council of Churches in India, Fr. Thomas Ninan, explained their work on ESHA, the program ‘Towards a Greater Inclusivity in Churches and in Theological Education’, and their efforts to include SGD.